This page shows how to create a “commercial” stabilized cash flow. Included Operating Statements: Select the historical operating statements you want to include in your underwriting. Default is all. Now you’re ready to verify your information and save changes. Rental Calc: Determines how the vacant space will be treated. Reimbursement Calc: “From Detail” pulls from the Expense Reimbursement data entered on the rent roll page. “From rent roll” pulls reimbursements based on the value entered for the tenant. Exclude Units by Status: If excluded, tenants of the selected unit status will be treated as vacant space. Apply Override Rent: Selecting Yes enables the ability to override contract rent on tenants in the Lease Level Assumptions section below. Percentage Rents: Allows percentage rent to be calculated based on actual historical sales or per the amount entered on the tenant rent roll. Op Statement Assumption: The action (Average, Max, Min) and the inflation factor are used to calculate all expenses except management fee. Management Fee: Calculated as a percent of EGI. TI and LC Rollover Approach: Either Straight Line (the normalized amount per the lease level assumptions) or Actual Approach (the actual roll per the entered term based on the lease level assumptions). Rent to Use for LC: The lease value used to calculate the leasing commission due. 4. Enter lease level assumptions. 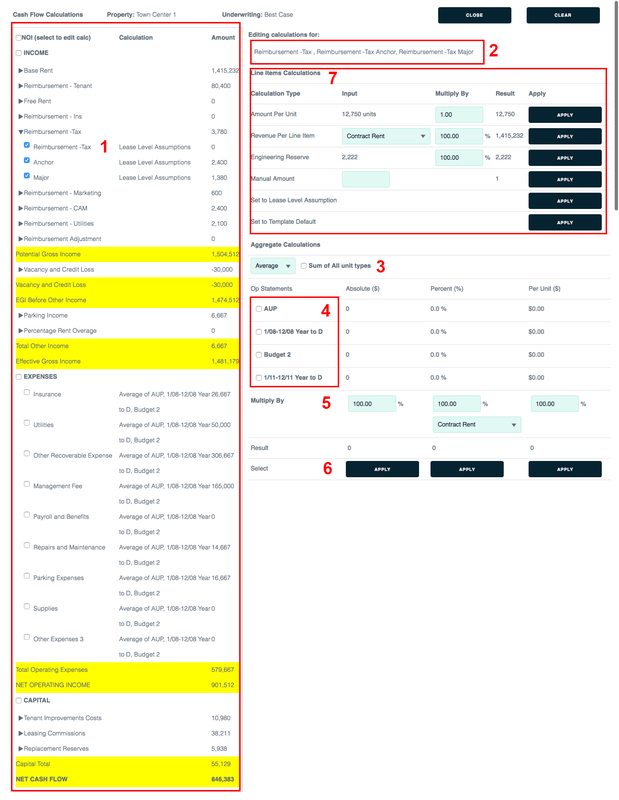 Type: Enter lease level assumptions that affect all tenants (Default), all tenants of a certain Unit Type (Unit Type), or by the individual tenant (Tenant). 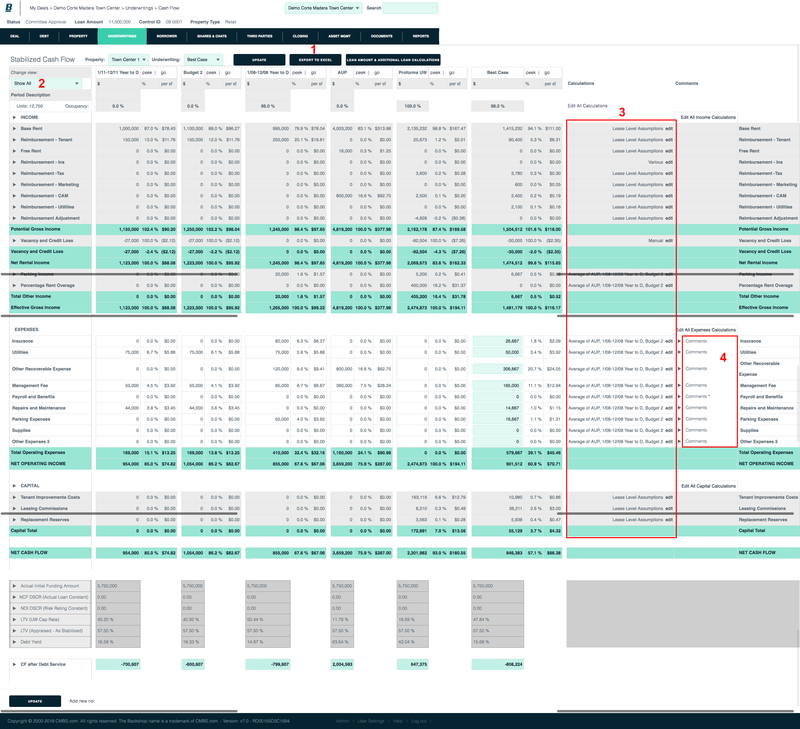 Analysis and Tools: These sections display critical data such as tenant lists, details of the Actual Approach, details of the straight line approach and tenant-by-tenant details. 1. Click the Cash Flow sublink in the Underwritings tab. This opens the cash flow in the same window, within the application’s navigation system. 2. Click the Open Cash Flow in New Window link. This is ideal if you have two computer monitors.